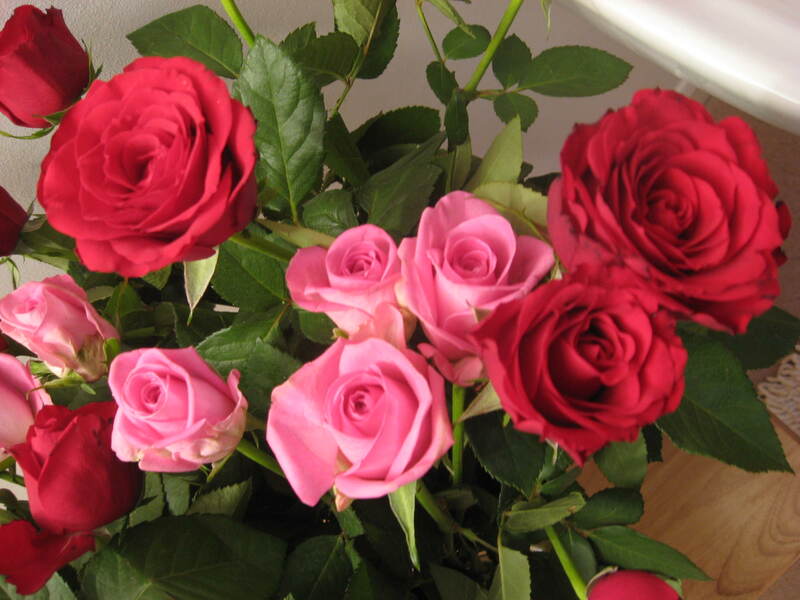 If I’ve Told You Once … by Ploy, a rose is a rose is etc. Lots of fascinating new words to drop into our erudite conversation this week. “Looking for a meuse, we wandered past the proseuche and dropped an inchpin into the snye …” However, the grid fill gave us surprisingly few moments of total despair. We wondered for a while who the Irish virgin could be (of course, the ‘elder’ who was guarding her was our French word ‘AINE’, and, as usual, that was the last word to spring to mind – we just shut out that part of the brain when solving Listener crosswords) but when we had put IRL into AINE and produced AIRLINE we had a moment of glee. What a fine clue! The Audis turning up at the end of RESIDUA (Are German cars turning up delivering things left behind?) gave us another moment of clue-admiration. There were a lot of those, as these solutions slotted together with only eight clashes to discover and agonise over. I had trouble, though with GENTLE. I am wondering whether now is the moment to read through all 1871 pages of Chambers to learn obscure, quirky things that Ploy obviously knows – like the fact that ‘gentile’ means ‘denoting country’, or that ‘peter’ is an Australian word for a till. We continue to learn and our very first observation had been the strangely unsymmetrical nature of the grid. 13 X 11 with no symmetry that we could recognize. Warning lights! There has to be a reason for that. Are we looking for a thirteen-letter author’s name? Gertrude Stein loomed into view in the obvious place right across the centre; and that is where ignorance is bliss. We only know one Gertrude Stein quotation, “A rose is a rose is a rose is a rose …” The roses were blossoming all around her name and four clashes were immediately resolved – 25 letters to highlight. A quick check in the ODQ gave us SACRED EMILY (I am told that counts as BOGOF – ‘Buy one, get one free’ in current youfspeak) as there were the words, right down the centre of the grid, giving us more than we had bargained for in highlighting terms. Don’t I make it sound easy? The ‘Stripey horse (5)’ team was gloating. BUT we had to find six letter pairs that could be removed from clues before solving. Oh dear. I believe the difficulty of that task balanced out the ease of solving. Two appeared with relatively little pain: ‘Distant call – MUso who’s first to go?’ gave us MU and ‘Is he, by TOday, in cast’ gave us TO. How cunningly the rest were hidden: ‘Has a NOmad party in governor’s office’ – I thought ‘nomad’ was a fine anagrind – why bother to remove the NO? ‘Bear in Banff is TAking in river’ It seemed to me that that insidious little R for ‘take’ was hidden in the River DEE – why look any further to find that TA? As for, ‘In a MIrage, a lion deserted swallow hole’: clearly I needed an anagrind, but ‘in a mire’ seemed to be a lovely original one giving me AG as a pair of letters. Why look further to find ‘in a rage’? Lastly there was ‘Heavy knife mostly protecting DaNE in foreign field’. It took a careful count of those As to find that we could use the NE of Dane. With all those consonant vowel combinations, it had to be Latin. MUTATO NOMINE – ‘The name being changed. My only remaining problem was a moment’s doubt about whether EIGG counted as a name. I decided that it didn’t, as, with excitement (yes, I know that I have to get out more) I recognised that when we removed the clashing letters of DOLINA, PETER, CHERRY and TAMARA, we were left with real words (DOLING, DETER, CHERTY and TAMARI). Oh the brilliance of it! Thank you, Ploy! Victim: Is this the right room for an argument? Arguer: I’ve told you once. Arguer: Look, if I argue with you I must take up a contrary position. Victim: But it isn’t just saying ‘No it isn’t’. The last Listener puzzle from Ploy, 4004 Signal Boxes, was a failure for me. The theme was logic circuit elements (AND, OR, NAND, etc), but it was one of many failures in 2008, so no harm done (but annoying nonetheless). 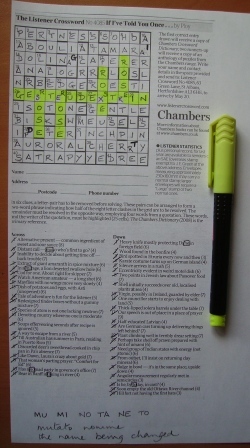 In this puzzle, a letter pair needs to be removed from each of six clues giving a two-word phrase, and then there are eight squares where letters clash. That’s not many, so I hoped they wouldn’t get in the way too much. My first pass through the clues was fairly productive with 14 solved. Quite easy clues too, with some hiddens, a regular hidden (eTrUrIa), and a couple of simple anagrams. My next clue, 6ac, gave me my first extra letters with [mu]so who’s first to go being the wordplay for SOHO. Another half-a-dozen clues and I got my first letter clash at 24ac and 15dn/22dn. The extra letters in the six clues took slightly longer to decipher: MU MI NO TA NE TO. I don’t know if being told that it was a Latin phrase and/or (6,6) would have helped, but I needed a cup of Tea to get the answer, MUTATO NOMINE, Latin for the name being changed. This didn’t really fit with selecting Gertrude Stein in the grid, and my initial assumption was that ‘must be resolved in the opposite way’ in the preamble would mean the opposite of across or down. The downs were favoured to give Gertrude, but the other down clashes also led to real words for the acrosses. PETER at 35ac finally made me see the light, with DOLINA, TAMARA, PETER and CHERRY, all names in Chambers and needing to be changed to new words using the letters of the down clashes. Finally I pondered a while over the appearance of SACRED EMILY in the central column, but we weren’t required to do anything with her, so I didn’t. I assumed she was there to give some additional pointer in the right direction. Highlighting her plus the four roses would have given 27 letters instead of the 25 required — thank goodness that was stipulated. I think there was only one tricky clue, 27dn, which could have been EGENCE or EGENCY. I was trying to arrange E (energy), GE (Georgia) and NC (North Carolina) states somehow, not having heard of agency meaning a group of Indian states. A good, straightforward puzzle from Ploy, so many thanks for a relatively easy week. It is just a little bit worrying for the Dumbos when the preamble spills onto the second page and reading it alerted us, at once, to the need for those over-used highlighters. Four different types of clue! Fortunately, some of them yielded up their secrets fairly quickly: SÛRETE, BAHRAINI, HESPERIS, ETHEREAL, PANOCHA, OSTIOLE, and ESOTERY. It feels good when we have something in each corner of the grid – we sort of ‘have it surrounded’ and by the end of Friday, we had an almost complete grid. 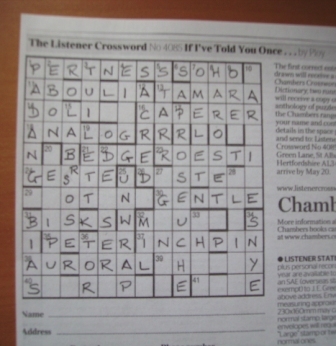 Brilliant – in fact we had thirteen normal clues! Doh! That wasn’t our only problem. I had misread the preamble (when will I learn?) and was attempting to compose a phrase with three of the clue types – not the initial letters of the normal ones. It looked very odd ‘ANNTLERBL etc. Fortunately, the back part of the ‘Stripey horse (5)’ team took another look at the preamble and pulled us out of that deep hole. A night’s sleep helped and a fresh look revealed ‘AN INTOLERABLE WRESTLE WITH WORDS AND MEANING’ Great! We know all about that. We’ve been doing it for over a year and a half, ever since we were infected by this Listener bug. Colour-coding those solutions revealed a lack of three types and an uncomfortable number of normal ones. SCHMOE was certainly not an American, yet the clue began with the A we needed; ‘American of broken home, led by us, see’. We finally teased the A into ‘of’, giving ‘oaf’ – rid of one of our extra normal clues. ETEN provided a similar problem. Again ‘Rodin’s term after his summer one with great statue’ seemed to be normal and the R was what we needed. Ah, but we found ‘statuRe’ – not ‘statue’ at the end of the clue. Sneaky! The biggest struggle of all was at 28a and 29d. We could see that we needed a fin to give us the E at the end of finE but VANE took some teasing out, ‘Backtracking French lawyer’s not forgotten fine’ (AVocat reversed, before NE). Then, of course, we had NOBLE for the ‘ac(N)e’ at 29d where we had been looking for an acHe. At last our numbers tallied! 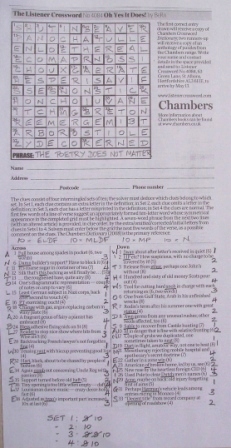 T.S.Eliot was one of my set poets at A Level and East Coker is familiar ground to crossword solvers isn’t it? 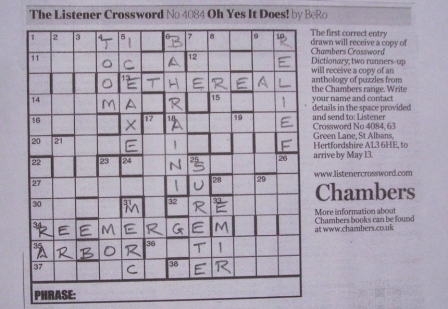 – Indeed, what a spectacular hidden message was lurking on the ground of BeRo’s crossword – ECOKER. However, we still had to sort out something from, ‘That was a way of putting it – not very satisfactory:/ A periphrastic study in a worn out poetical fashion,/ Leaving one still with the intolerable wrestle/ With words and meanings. The poetry does not matter. Enjoyable (did I say that?) thank you, BeRo! Just short of twenty BeRo crosswords since 1990, all but a couple being Listeners (the other two were EVs about ten years ago). The last two Listeners were 3847, Pseudo-clue, and 3987, Fizz Buzz, which was loosely based on the pub quiz game. 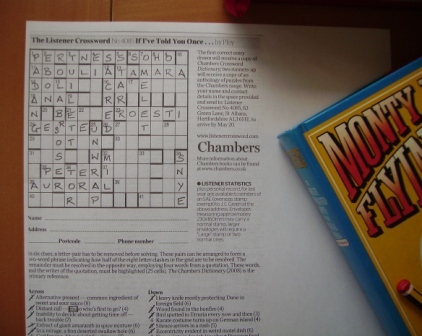 This puzzle has four types of clue with relevant letters (extra/missing letters in definition, misprints and the initial letter in normal clues). These special letters spell out a phrase from a verse. 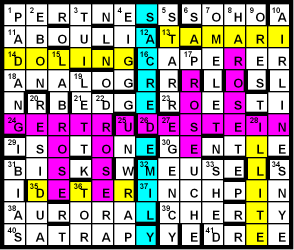 The preceding line suggests a ten-letter word which has to be identified and highlighted in the grid. 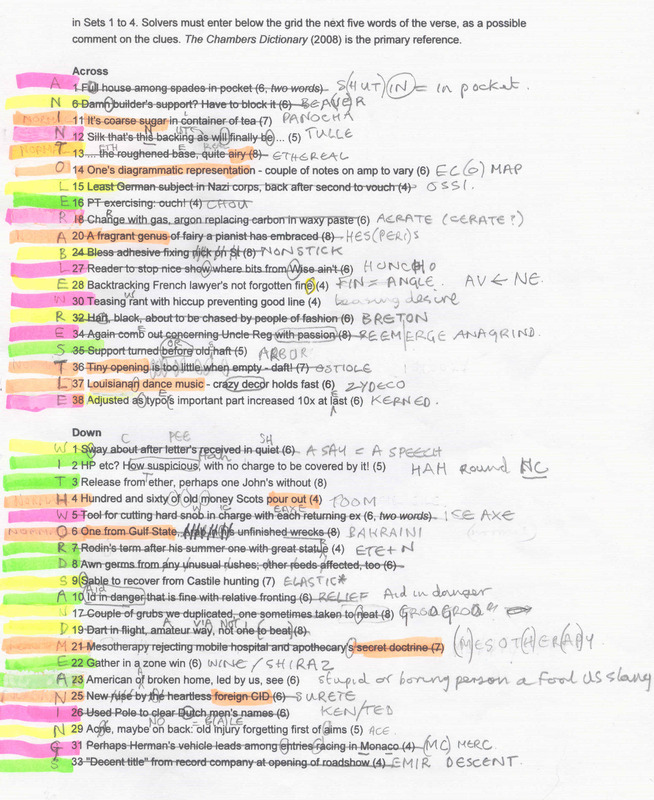 It all seems straightforward, and I annotate my copy of the puzzle with the types of clue. I find this useful to avoid having to continually reread the preamble to remind myself of clue types (I read the preamble enough times as it is). This is especially useful if flipping between Listeners, Inquisitors and EVs where there will most likely be a different clueing mechanism going on. I also decide to mark the Set to which each clue belongs. My only question at this point is whether the ‘corrected’ letters in misprints are those that are being corrected or those that have been corrected! 25dn SURETE (normal) … and whatever happened to the old ‘Ignore accents’ in the preamble?! Somewhat strange that none of these is a Set 1 clue type. Anyway, the answers give me a good inroad into the puzzle in pretty much all segments. The rest of the puzzle is relatively quick, and one of the easier Listeners this year. I don’t think any of the clues are particularly difficult or sneaky, but enjoyable nonetheless. The phrase from the verse is shown to be ‘… an intolerable wrestle with words and meanings’ from TS Eliot’s Four Quartets ‘East Coker’. So, THE POETRY DOES NOT MATTER goes below the grid (in fairly scrunched up writing). And what has that to do with the clues? Oh yes … they rhyme … sort of! Did anyone out there spot this before getting to this point? All in all, a very enjoyable puzzle from BeRo and, thankfully, not too difficult a final step. We liked that title and it might have given us a hint, but we didn’t see it until after we had solved our first clue, which, by a stroke of luck, was that delightful 6d, ‘Hasty prophecy goes wrong – you might need some sort of cure (13)’ PSYCHOTHERAPY! 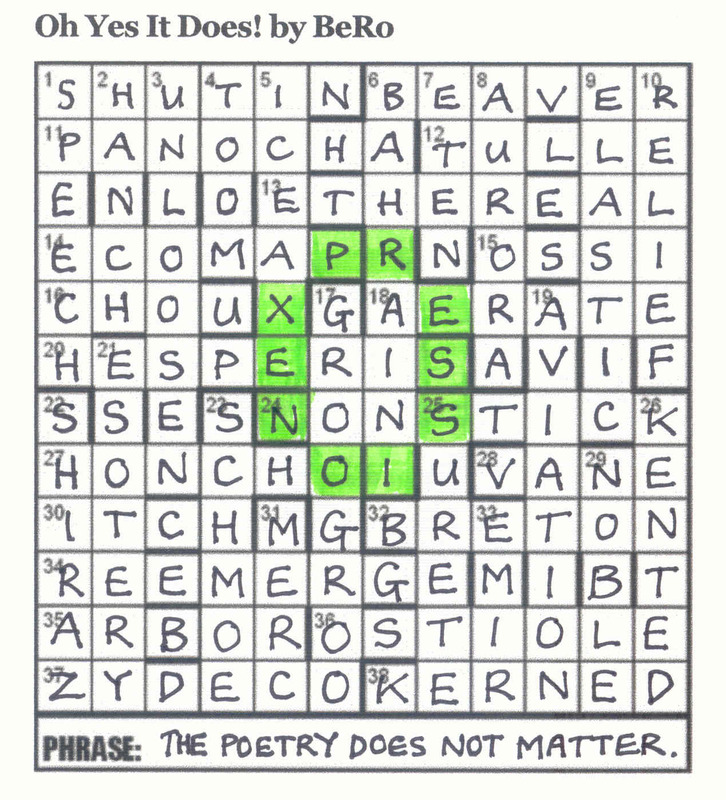 What joy for us less confident solvers to have the crossword immediately split into two smaller ones with such a long, easily solved anagram. 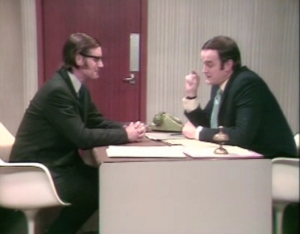 Of course, even the Numpties were aware that we were going to find something different here, with a mean word length of 5.2 and 56 clues including eight three-letter ones. And we were going to ‘put in some work’ to ‘generate the final grid’, so something was going to change once we had completed our initial grid. Yes, we are learning to read the preamble carefully and examine the initial grid before we start! 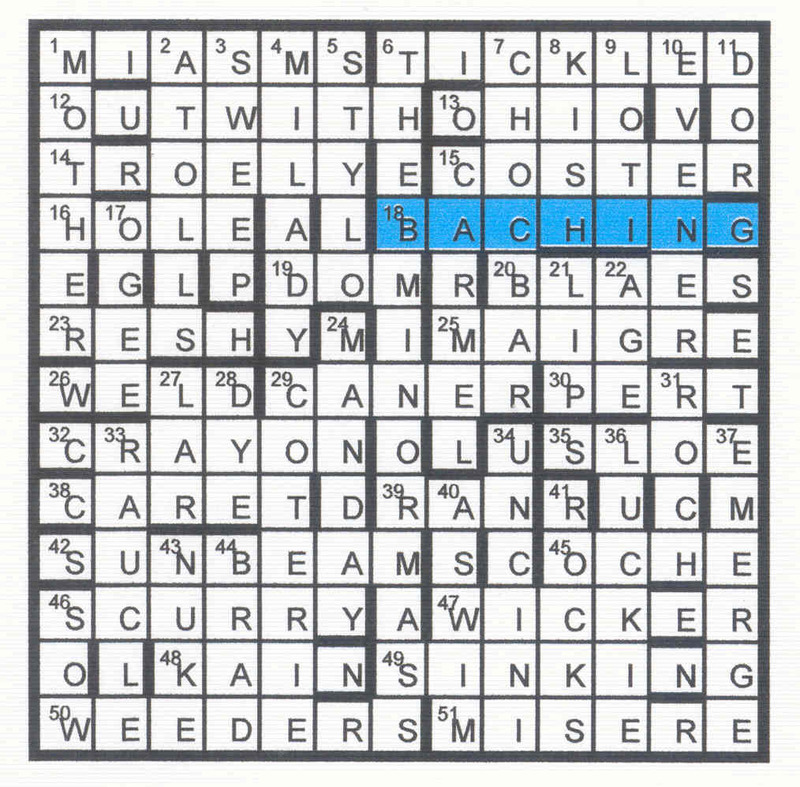 We found Bandmaster’s wordplay very challenging and were well into Saturday before we had a complete grid. However, the clashes seemed to be indicated by less difficult clues, and soon we had an obvious MICHAEL. (You’d be amazed how many MICHAEL ????? there are on the Internet!) It was when we got the ? ?RKE that we were able to find Michael Torke’s ‘Why waste money on psychotherapy when you can listen to the B Minor Mass?’ – apparently quoted in the Independent on September 25th 1990 (so there’s one in the eye for the critics who complain that compilers are a bunch of plus-foured fuddy duddies entrenched in 1950s culture). The finest of these adaptations was certainly CACHING, which converted to BACHING, a lovely coinage that seems to suggest that lying back listening to Bach will solve all our mental problems. (I am reminded of Toni Morrison’s Tar Baby – a superb novel in which Valerian Street, verging on senility, shuts himself in his greenhouse, listening obsessively to the Goldberg Variations). PICKLED ‘Tool with guide for blind’ Guide didn’t seem to match LED until it was explained to me that PICK was the tool and ‘with guide’ gave LED. TROELY ‘This palm could be swaying temporally’ A composite anagram of TROELY PALM – no wonder I had trouble! ACHE ‘First sign of hangover? (There’s the alcohol creeping in again!) It used to be’ ACHE, the first letter (aitch) of hangover in Shakespeare’s English – and an &lit too! LIP ‘Overrun the edge of parking distance in van’ P = parking. LI = Chinese measure of distance, in van = ahead of, i.e. in front of the P.
NUKE ‘To use the microwave on fried chicken – not smart but acceptable’ I like the surface reading more than I did that of the last clue where a ‘Fat woman is old and wide’ turned out to be a SOW (Hmmm!) or even the rather cheeky ROCKS for ‘Balls and dances’. NUKE was CHICKEN minus CHIC (smart) plus U (acceptable) and it had to be ‘fried’ – anagrammed. Well, I have finally got my head round all that wordplay. It was almost as challenging as Radix’s Double Cross and very rewarding.